The square exist for a large part of a grass field: the Padang (picture above). Around this field are the most interesting buildings. 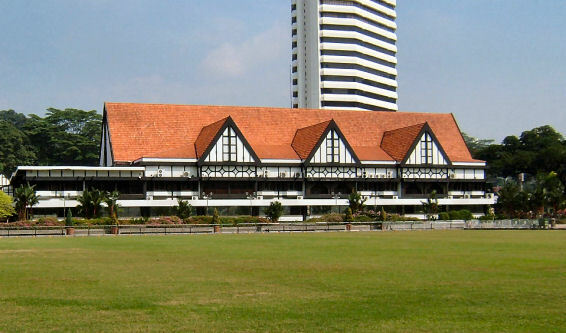 We're starting at the Selangor Club (1884, picture above). Seen from across the Padang, which was originally a cricket field. In 1892 it had 140 members including some who were absent from Selangor. Before there was a club everybody met everybody at Maynards, which was the only European shop in Kuala Lumpur . . . In theory Maynards was a pharmaceutical chemist but it also sold liquor and a wide range of other things. Ladies went shopping in the confidence of meeting friends and lingering to chat. The Selangor Club met a need for a social centre as such. . . . It was originally housed in a "little plank building with an atap roof" to serve as a cricket as well as a social club. Merdeka Square is also the popular venue for various other events - open air concerts, carnivals, starting/finishing point for marathons etc. Occasionally it will be turned into battle ground for cricket match, just like it used to be during the colonial days. On the photo at the right you can see the stage for a concert, given that evening. Merdeka Square better reflects its status as it was at this place on midnight of August 31, 1957 that the Malayan flag was hoisted for the first time in the country's history upon gaining independence from the British rule. As a remembrance to this event, a 100 metre high flagpole, which is the world tallest, was erected at the very place where the Malayan flag was hoisted on the independence day. On August 31 every year the Merdeka Day Parade will normally be held here. Beneath the square is Plaza Putra, an underground food, leisure and entertainment complex (the Actors Club). Unfortunately Plaza Putra was flooded after a very heavy downpour recently and still close to the public. Just the underground parking bay is still open today. 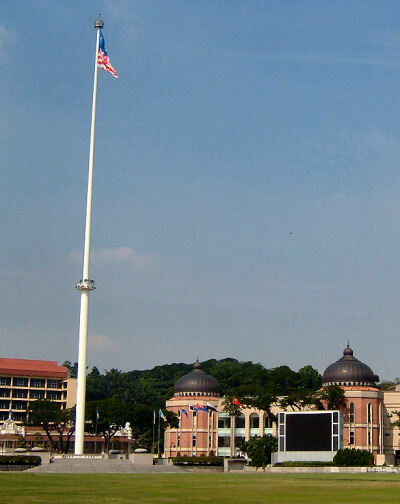 At the left of the flagpole is the National History Museum (Muzium Serajah Nasional). It's former commercial bank dating back to 1910. The museum opened its doors in 1966 as National History Museum and enables visitors to discover the wealth of Malaysia's historical heritage through its permanent exhibition of artefacts and materials. There is an impressive collection of artefacts and dioramas depicting various facets of Malaysian natural history from the ancient past to the present day. Exhibits relate pre-historic and megalithic ages, the Johor-Riau Empire, Malacca sultanate and the colonial era. The collection includes also a 520 million-year-old metamorphic sandstone, a 40,000-year-old homo sapiens skulls and an eight-sided gold coin dating back to the 15th century. 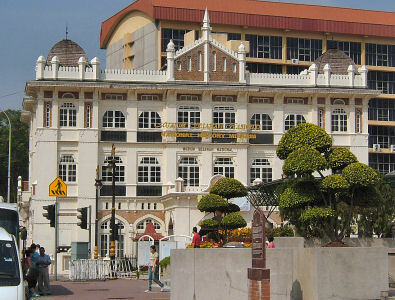 The most beautiful building at the Merdeka Square is, without any doubt, the Abdul Samad Building (photo at the right). The Sultan Abdul Samad building was constructed in 1897 and designed by a British architect, A.C. Norman, who worked for the Public Works Department at that time. He took into consideration some of the features of buildings in several Islamic countries. The predominantly Moorish appearance of the building suitably reflects the cultural background of Malaysia. The unique Moorish-style building has a 41m clock tower, dubbed 'Big Ben'. 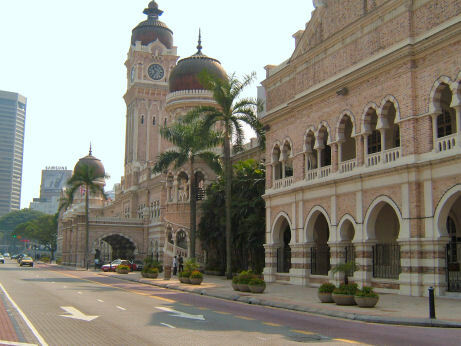 The Sultan Abdul Samad Building was originally known as "The New Government Offices". It was to be the largest building of its day, constructed entirely of brick and what appears to be cream stone is actually plaster covered brick. When Selangor transferred its administrative offices to Shah Alam in 1974, the building was extensively renovated to house the nation's judiciary. This grand building has been left vacant recently when the "courts" move to Putrajaya, the new administrative centre of Malaysia.